The aftermath of a ceiling collapse at the Taco Bell inside Trumbull's Westfield Shoppingtown. A ceiling collapsed at the Taco Bell inside the Westfield Shoppingtown mall in Trumbull Friday. Firefighters responded to the scene at the mall's food court just after 11 a.m.
Three workers inside the restaurant were able to escape from under the collapsed sheet rock, police said. No customers were hit by the falling debris. The area around the Taco Bell was immediately evacuated and cordoned off, according to TrumbullDeputy Fire Chief John Plofkin, Jr.
Electricity and natural gas into the restaurant were shut off as a precaution, Plofkin said. 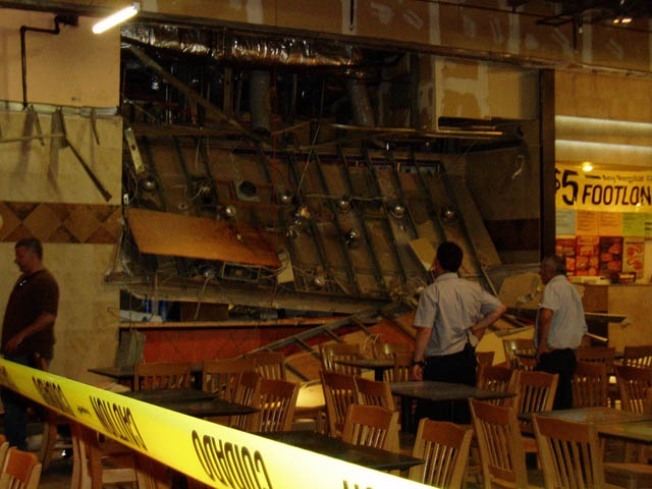 The section of the food court affected by the collapse was expected to remain closed while investigators tried to determine what caused the ceiling to collapse.